Scrambler: a word often used to describe a mobile quarterback who is able to move around the pocket, escape pass rushers, and pick up rushing yards. Also a word to describe me typing this article, scrambling to finish it, get my notes, and type it on my phone. I’m at Notre Dame for the weekend, visiting my girlfriend’s sister and seeing the ND – GT game (shout out Emma and Steph). So you can expect a more comprehensive break down of that game tomorrow. And you can also expect a shorter version of week 3 picks today. Let’s start with Notre Dame and Georgia Tech. I want Notre Dame to win. I do. 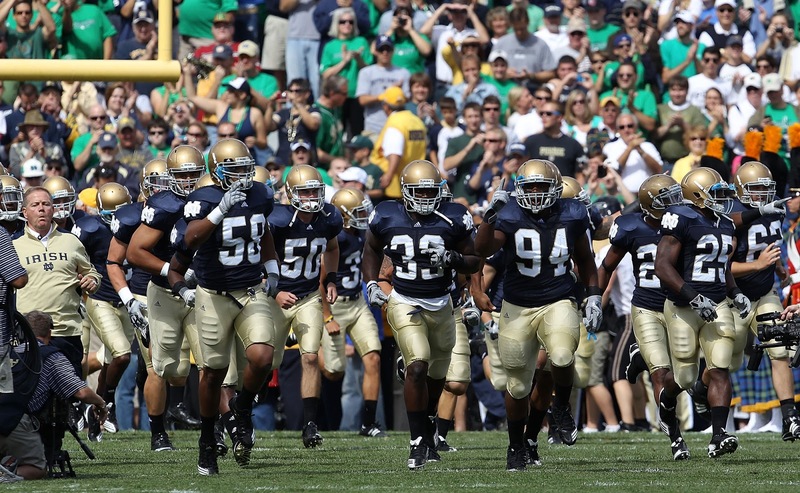 I want to be in the stadium for a home win and I like the Irish this year as a playoff contender. But I don’t like them being down five starters or the unnecessarily close game they had against Virginia. I also don’t like the way the Irish play against the triple option. Navy runs it, and they’ve averaged 333.5 rush yards per game against ND in their last few matchups. Tech runs it better. BUT, theyve had some sleeper games and I think the defense could be caught napping in this one (two sleep references in one sentence, for those counting). The Irish are good at home and at the risk of getting kicked out of South Bend, I’m picking Notre Dame. LSU plays at Auburn this week in what I’m predicting will be the worst game between two ranked teams. Remember when Auburn almost lost to Jacksonville State? Remember when LSU won on the road against Dak Prescott? LSU will win big here. BYU and UCLA will be an exciting game. True freshman Josh Rosen has looked solid but besides Virginia (one of the best 0-2 teams in the country, but still 0-2) he hasn’t been tested. I think UCLA’s defense will be the difference and will be able to stall Tanner Mangum. Barring a third game winning Hail Mary, I’m picking UCLA. Ole Miss at Alabama is the College Gameday Game of the week. Alabama lost to the Rebels in a fourth quarter stunner, in a stretch where Ole Miss went 7-0. They’ve scored 76 and 73 points in their first two games respectively, but it’s been against no-name opponents. Alabama has a solid win against Wisconsin but their offense isn’t nearly as explosive as Ole Miss. I think it’ll be too much for the Crimson Tide to handle and they’ll pull off another upset. Colin is a Fordham University grad, Founder of How ‘Bout Them Sports, and notable Fantasy nerd. If he isn’t annoying friends and family by talking sports for 5 hours straight, he can normally be found on the couch watching old movies, humming one of the 10 songs stuck in his head, or bragging about his most recent FIFA victory on his PS4. A New York City kid through and through, he can be heard on ESPN New Hampshire every Saturday from 2-4 along with fellow HBT Sports writer Ricky Cibrano. Follow him on Twitter @ColDontLie and be sure to tell all your friends about HBT Sports (I’m sure he would appreciate it).